Liberty to ourselves and our Posterity. If you like, you can edit this paragraph. Be­cause of se­cu­rity con­sid­er­a­tions, my pay­ment links do not sup­port In­ter­net Ex­plorer 11 or ear­lier. Please use a dif­fer­ent browser. 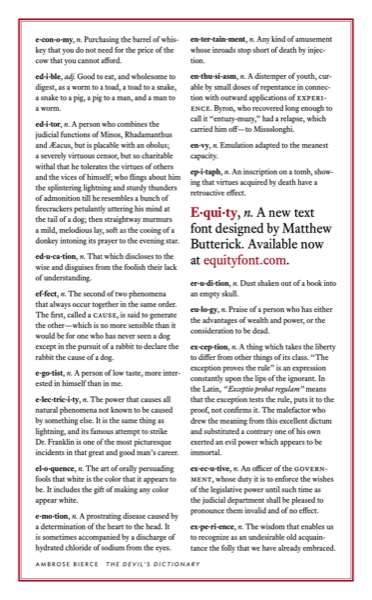 Eq­uity fits as much text on the page as Times New Ro­man, and stays leg­i­ble down to small point sizes. Eq­uity has been de­signed to per­form well on both high-end out­put de­vices and of­fice print­ers. Each style in the fam­ily comes in two weight grades so you can pick the grade that looks just right on your printer—a fea­ture found in very few fonts. Eq­uity comes with a sep­a­rate set of caps fonts, which con­tain real small caps and al­ready in­clude my rec­om­mended let­terspac­ing. Eq­uity has a short, plain-Eng­lish font li­cense that in­cludes per­mis­sion to use it in PDFs, web­sites, apps, and elec­tronic books. Eq­uity has no demo ver­sion, but I of­fer a 30-day re­turn op­tion: if the fonts aren’t your style, you can can­cel your li­cense for a refund.